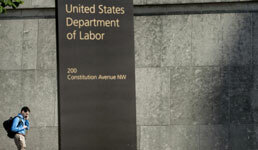 The Department of Labor is seeking comments on a proposal that aims to reduce “leakage” from 401(k) plans when employees change jobs, InvestmentNews writes. From 2005 to 2015, 25 million 401(k) plan participants separated from an employer and left at least one account behind, the Government Accountability Office reported in 2017. And “millions” left behind two or more accounts, the GAO found, according to the publication. The “leakage” caused by these forgotten accounts eats up to 25% of retirement wealth in aggregate, according to a 2015 analysis by the Center for Retirement Research at Boston College cited by InvestmentNews. The DOL’s proposal would set up “auto-portablity” for the plans, by which plan participants would get their 401(k) funds automatically reconnected when they change employers, according to the publication. Currently, companies can cash out 401(k) balances of former employees if they’re less than $1,000 and send them a check, InvestmentNews writes. But employers must roll accounts that contain $1,000 to $5,000 into an individual retirement account for the employee, according to the publication. The current proposal would apply only to balances of less than $5,000, InvestmentNews writes. The proposal would give a five-year exemption to Retirement Clearinghouse from certain restrictions, according to the publication. The company offers an auto-portability mechanism that rolls 401(k)s into IRAs when an employee leaves a job and then detects when the employee lands a new job and automatically rolls the funds to the 401(k) with the new employer, InvestmentNews writes. RCH needs an exemption from the Employee Retirement Income Security Act of 1974 because it acts as a fiduciary in these transactions while collecting a fee for its services, according to the publication. Currently, fiduciaries are banned from getting fees from such transfers without consent from the user, InvestmentNews writes. The comment period on the proposal ends Dec. 24, according to the publication.